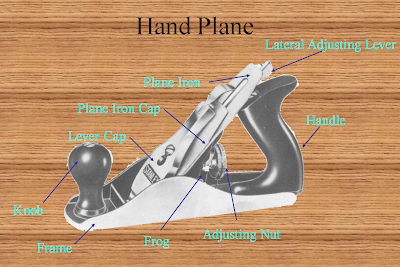 The most popular hand plane in the world is the so-called No. 4 bench plane. This is the one most readily found in Indian hardware stores and the first choice for woodworkers because it can do a wide variety of tasks. The standard plane No 4 bench plane, which is also known as a smoothing plane after its principal function, is light on the hands yet substantial enough to plough through the hardest of wood. While all planes smooth, some do the job better than others and are easier to use. The No. 4, also written as #4, is of medium size (about 9 inches long with a two inch wide blade), easy to handle and is usually tuned for smoothing a board after it has been scrubbed and flattened by other planes. A properly tuned #4 will do much more: it will pare end grain, square sides and flatten even the nastiest of tops given patience and a sharp iron. They key to all planer operations is of course a sharp blade - and sharpening is another topic altogether. In India, several companies make this plane and some make them better than others. In general these planes are cheap, ranging between Rs 350 and Rs 450. The quality of these planes are however highly variable even within the offerings from individual makers. I no longer blindly trust planes from any one manufacturer but look for a few qualities in a plane before making a purchase. The first thing to look at is the sole of a plane. It must be reasonably flat or else it will not plane properly. Slight imperfections are acceptable because the sole can be flattened but a highly concave sole can be virtually impossible to correct. More important, the portion near the mouth or throat of the plane, that is, the slit from where the blade emerges, needs to be at one level. Secondly, the blade must sit properly and not rock or move once it has been locked down. Third, the quality of the blade and the cap iron should be checked; obvious imperfections should be spotted though the more subtle ones become clear only during flattening and honing. The blade and the cap iron should be removed and the frog tested for stability. Additionally, the lateral adjusting lever, the movement of the adjusting nut and overall feel of the plane could be tested. A newly purchased hand plane will not be ready for use unless it is a pricey imported one from one of the better known Western plane makers such as Veritas and Lie-Neilsen. India made hand planes as well as those made by the well-known international brand Stanley Tool Works will require considerable work to tune and sharpen as I had learnt the hard way. Initially my hand planes were clunky monsters that ripped out rather than shaved bits of wood. I tried to sharpen and tune them the best I could but it was not until I watched several videos by master craftsmen such as David Charlesworth and Rob Cosman that I discovered the secrets of preparing a hand plane. Nowadays every time I use my hand plane and recall my first attempts at planning, I cannot but help smiling. I feel deeply pleased as my hand plane takes off thin shavings of wood with a precision that is truly marvellous. Anyone planning to use a hand plane must first learn to sharpen and tune it. The best source for information again is the Internet and the three best teachers on the subject, in my humble opinion, are David Charlesworth, Rob Cosman and Peter Sellers. Seek out their videos and instructions to prepare hand planes to perfection. Even within Stanley No 4 planes there appear to be a number of variants, the planes being numbered beginning with a 12- followed by another number. For instance, the 12-204 and 12-904 are both No. 4 planes made by Stanley but with slightly different features. The 12-204 is priced by amazon.com at about $31 while the 12-904 is priced at $ 51. Both are 9 ¾ inches long and have blade irons 2 inches wide. The 904 is called 'contractors grade' and is perhaps slightly cruder than one that a cabinetmaker might prefer. The Stanley 12-404 is also a #4 plane but for some reason comes with a short blade. In all, the variety and classification of Stanley planes can be quite confusing. It is best therefore to think of a No 4 plane as a 9 inch long smoothing plane with a few variants. I compared three #4 planes available in India: Stanley, Anant, Ambika and Soba. The Stanley is the original design and the other two are basically copies of it, and so for the matter are all the other #4s made all over the world. Anant is a well-known Indian hand tools manufacturer that has been in the business for many years and exports its planes to the West as well. There is a considerable difference in the quality of Anant products sold domestically and those exported. Both Anant and Ambika are based in Ludhiana, Punjab. Soba planes are made by the Delhi based Shobha Industries which has its factory at Sonepat. Soba planes are not very well known in India because till recently their planes were for export only. The workmanship of Soba planes is generally outstanding and the #4 was no exception. Stanley makes most of its cheaper hand planes in countries like Mexico and China. The workmanship of these Stanley planes is generally not very good but the basic design and standard of components is better than the Indian ones. The Ambika plane was the cheapest (street price about Rs 400), followed by Anant (street price Rs 450), Soba (Rs 1320) and the Stanley (street price Rs 1,500 and about US $ 32 in amazon.com). All the planes look similar, which is understandable given that they are all of one type. But a closer inspection reveals differences that could have significant impact on performance. Feel and weight: The Ambika plane was the lightest but felt nice in the hand; the Anant was heavier and the Stanley clearly the heaviest and the most sturdily built. The Soba plane was lighter than the Stanley and Anant planes but felt nice and easy in the hand. Some people, included me prefer heftier smoothing planes, while many prefer a light one that can be used for long periods without causing fatigue. Quality of construction: Soba first, Stanley second, Anant third and Ambika fourth. Metallurgy: Again Soba was miles ahead but Stanley and Ambika were not too bad either, especially for the price. Anant was quite poor in fact; even the chip breaker rusted before I got around to tuning the plane. Blade Iron: The iron blade metal was softest and therefore easiest to prepare in the case of Anant. It was also more liable to rust than both Stanley and Ambika blades. The Stanley blade had a ‘Made in England’ sign etched on the blade but the milling was far from great and took a fair amount of time to flatten its back. The Ambika steel appeared to be the hardest to prepare and had a circular high point that took a long time to wear down and flatten. The Anant and Soba blades were the thickest, followed by Stanley and then Ambika. All blades could however be sharpened to a crisp edge. Only the Soba blade came almost ready to use from the factory. It required only a light honing to perfect the edge. This is a huge advantage compared to the other blades that took hours to sharpen and hone. The back of the Soba blades too are extremely flat and did not take much time to bring to a mirror finish. The only problem was with the cap iron tip that was ground at the wrong angle and had to be sanded to prevent shavings jamming the blade. Flatness of sole: The flatness of the sole should ideally be checked against an engineer's straight edge. The sole of the hand plane rested on the straightedge will show imperfections when held against the light. More precise checks could be carried out by inserting a feeler gauge between the sole and the straightedge. Here again the Soba plane scored with an absolutely flat sole. Stanley was close to being perfectly flat, followed by Anant, which only had a small concavity near the throat. Ambika was flat around the throat but otherwise was distinctly convex. Flattening the Ambika plane is going to take hours and I do not think it worthwhile. I suppose I will use it only for roughing work. I tested the soles with a metric feeler gauge and selected the thinnest strip which was .02 mm. The Stanley did not let the feeler gauge to pass while the Anant plane only allowed it in one place in front of the throat. The gauge moved easily under the convex ends of the Ambika plane. The frog: The machining of the frog was very obviously the best in the case of the Stanley plane and required only minimal adjustment. The Anant blade and cap iron also sat well but not as comfortably as in the Stanley plane. The Ambika frog rocked slightly and had to be taken off for adjustment by filing the contact points on the plane base. The Soba frog was well seated but not perfect. Verdict: The Soba plane was clearly the best of the lot followed by Stanley and the Anant planes. The Ambika plane was tolerable but would require a fair amount of work to prepare. The Soba #4 was miles ahead of the competition and really the only good option available for Indian woodworkers. It is cheaper than the Stanley ones and far superior. The Anant is pretty good value for money considering that its #4 plane does not even cost ten US dollars. For that kind of money one could expect junk but Anant is not so bad. I only wish the makers of Anant tools would introduce a premium range with more attention to detail and better finish. There is a large and growing market in India today for premium hand tools, though not in the price range of top Western tool makers like Veritas. Stanley's contractor grade hand tools sold in India do brisk business and I have been in a Delhi Stanley dealers shop and watched with amazement at the rate people are buying these tools which are three to four times more expensive than their Indian counterparts. If Stanley can sell their more expensive hand tools there is no reason why Indian hand tool makers cannot do the same. 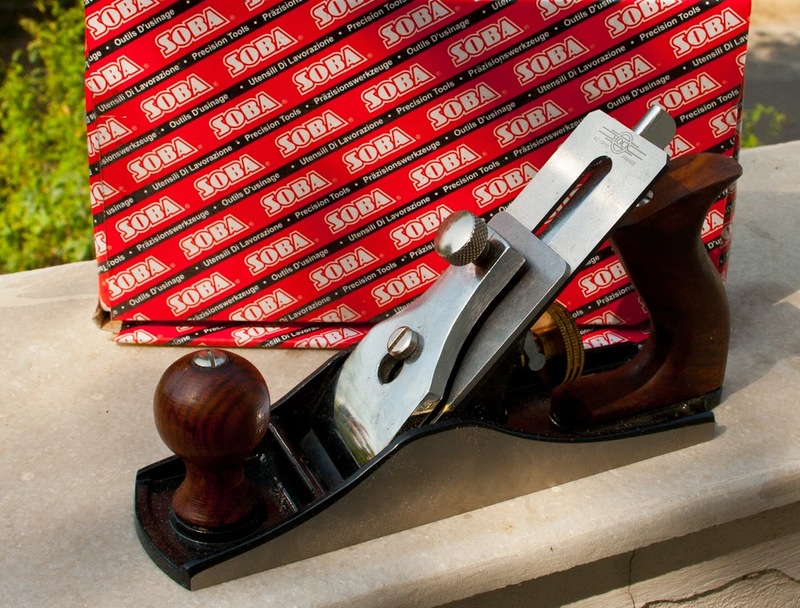 Given the multiplicity of hand plane makers in India and the wide variation in quality, it would perhaps make most sense to stick with the better known brands, especially a top notch one like Soba. Before buying any hand plane, however, check it out thoroughly. Thank you so much.It is very useful for people like me who are in the market for a plane. What is your opinion on electric planes ? Is it any good ? Electric planes are difficult to control and in my opinion not meant for furniture making. They are however extremely useful for carpenters making houses, frames etc and rapidly and roughly sizing large pieces of wood. Glad to have stumbled upon your blog! I have just started my woodworking journey as a hobby. Could you write about some simple woodworking projects and tools needed for a beginner in India. Excellent review, very detailed. Thanks. Do you have any links where we can purchase these online ?. Chinoy, apologies for the delayed reply but blogger has been misbehaving these past few months. You can get these hand planes on amazon.in or try directly from Shobha industries website http://www.shobha-india.com.